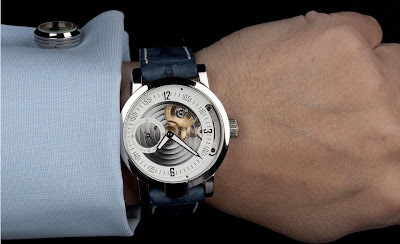 Regular readers of the Watchuseek blog may recall in April we featured the excellent watches from the ARMIN Strom Racing Collection. Read all about it here. 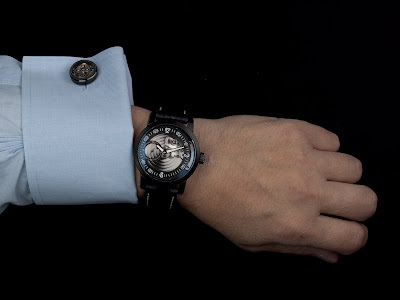 We were so impressed that we got in touch with the guys at ARMIN Strom and told them that we would like our readers to see the watches ‘on the wrist’ to show off how good they look, and they were happy to oblige. There was just one problem. If Ernie were to receive the watches in Holland it would have resulted in obscene sums being handed over to the Dutch Customs. So instead, the helpful chaps at ARMIN Strom offered to take pictures of the watches themselves. The model even donned a smart French cuffed dress shirt complete with watch movement cuffs, so ARMIN Strom are spoiling us! 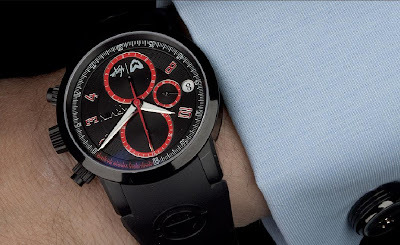 To recap, in 2011, ARMIN Strom began its commitment to Formula 1 as the official timing partner for Marussia Virgin Racing. It is supporting both team drivers: Germany’s Timo Glock and Jérôme D’Ambrosio from Belgium. 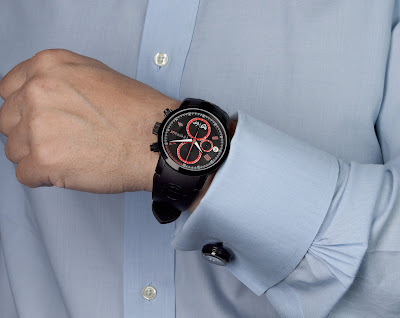 At the time of the launch Serge Michel, CEO at Armin Strom, commented on the logical collaboration: "Just like Marussia Virgin Racing, Armin Strom is a young, dynamic brand, setting new quality standards and combining high-tech with craftsmanship values. And like Marussia Virgin Racing, we’re not afraid to blaze new trails”. 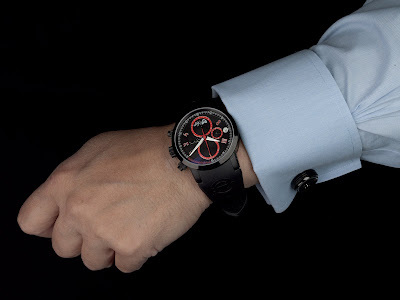 The first watches to emerge from the collaboration with the Russian-British stable, are called the ARMIN Racing Collection. The special feature of these watches is that parts of the movement components are made from the materials of the racing cars. In addition to the ARMIN Strom Racing Collection, the new AMW11, a magnificent looking manual wind watch with a partly open dial is also modelled for your delight and further edification. The AMW11 (ArminManualWinding1) incorporates the famous watch craftsman’s tradition of movement refinement. The partly open dial reveals the inner workings of the movement and the beauty of its technology. 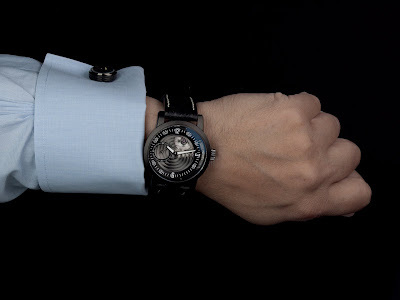 An unmistakable feature of ARMIN Strom watches is the time display: the hour and minute hands are not centrally positioned, but slightly off-centre horizontally. 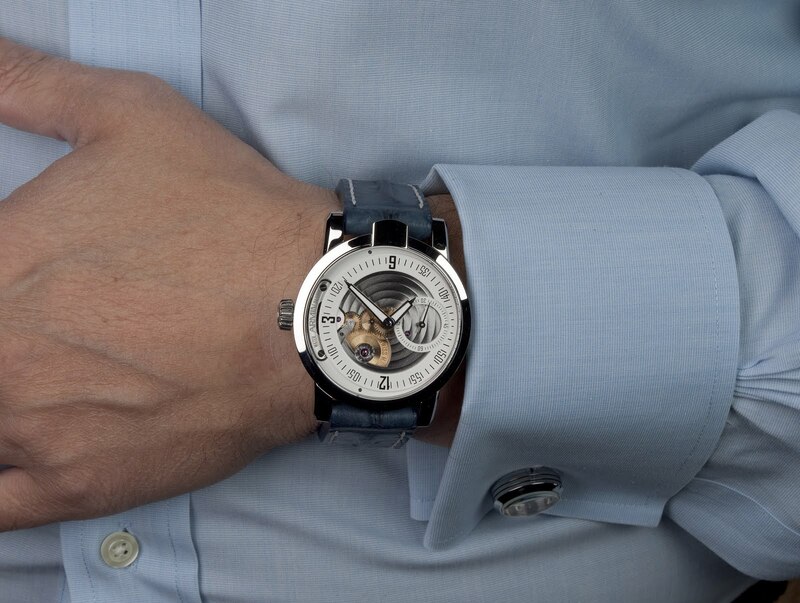 The designer’s objective was to create an exclusive watch with a Manufacture calibre. 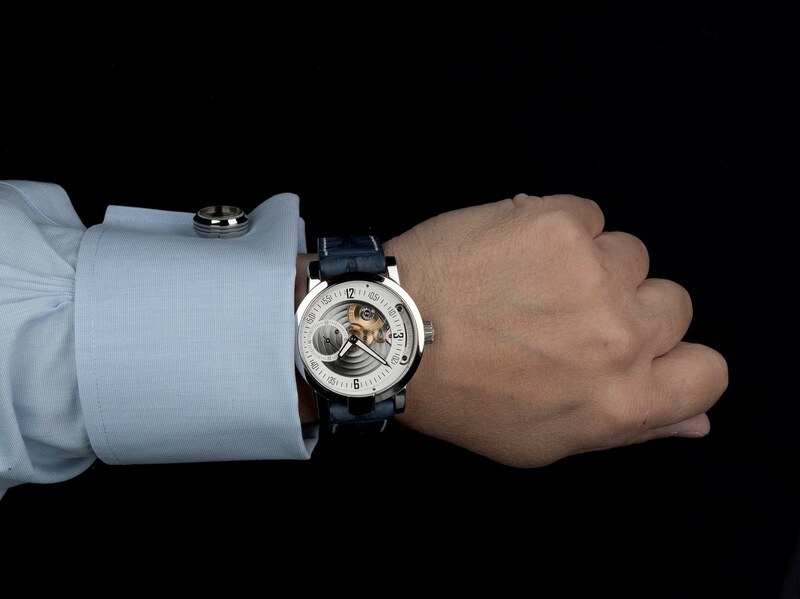 This watch is available in four different models, corresponding to the four elements Water, Air, Earth and Fire. Each model is being produced in a series of only 100 pieces. Prices will range from $10,300 to $13,000 for the top of the line Manual Air. Worn proudly on the wrist in this picture is the ARMIN Racing Chronograph, with its black PVD titanium case in an imposing 44.40mm. The components are sculpted from materials used in racing cars. The circles around the various indications on the dial, highlighted in bright red, serve as a clear reminder to mechanical sports enthusiasts of the efforts exerted by brake discs during a gruelling Grand Prix race. 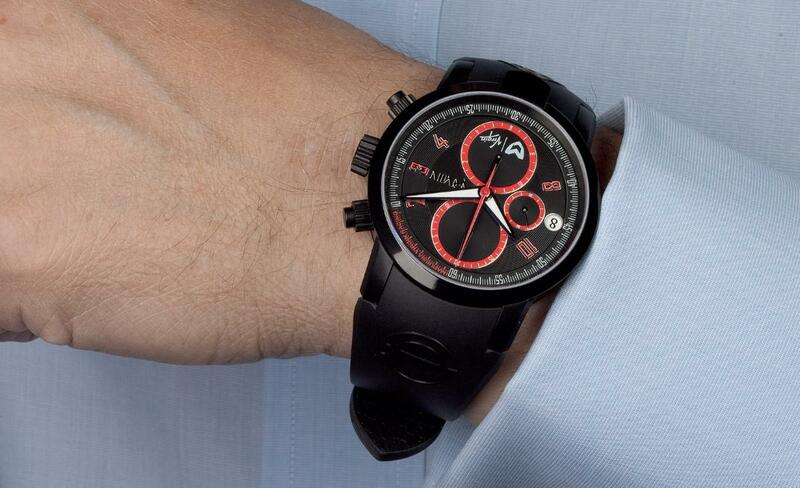 Proud owners of an ARMIN Racing Collection watch can opt to have their name engraved on the lip at 6-o-clock. In the case of the DLC case it’s engraved first and then DLC coated. 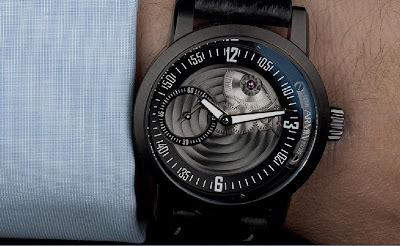 Other watches in the ARMIN Strom Racing Collection and not featured here were limited to 40 pieces and have no doubt long been snapped up by collectors. They included the ARMIN Strom Racing Regulator and the Racing Chronograph Titanium. 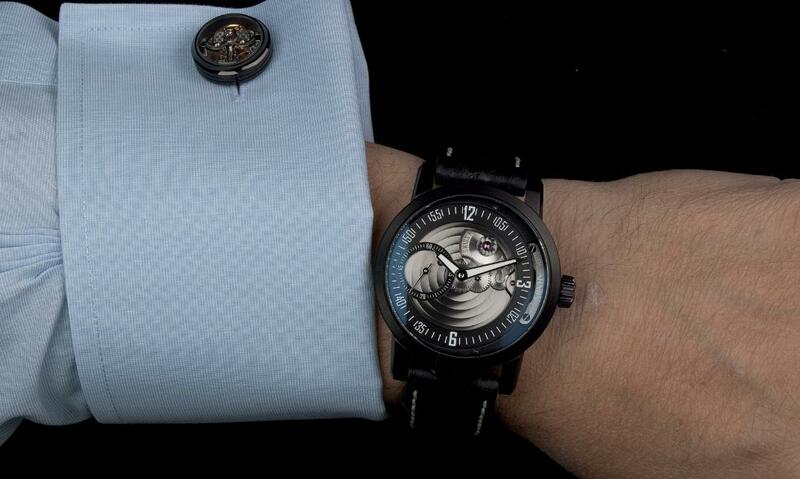 What follows is the full set of high res pictures that ARMIN Strom sent us. Click on the images for full effect.